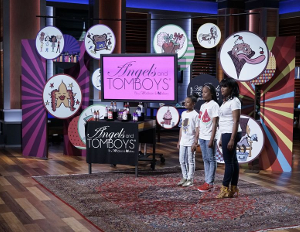 Earlier this month, Memphis-based Angels and Tomboys® secured a deal with Sharks, Daymond Johnand Mark Cuban. Later this month, Philadelphia-based LuLu Bang will pitch their business to the Sharks. Co-founded by two kid-trepreneur sisters, nine-year-old Mallory (the tomboy) and 11-year-old Madison (the angel), Angels and Tomboys® is a beauty and body care company for “tween and teen girls.” The current line employs a paraben free, patent pending, and vegan friendly formula. Scents include Candy Star Glam™, Frozen Hot Chocolate™, and Lemonade Doughnuts™. After sharing their story and motto, “All girls are created equally different,” with $58,000 in revenue to date, Mark Cuban and Daymond John invested $60,000 for 33% of the company.